I can finally share a quilt I have had sitting around for quite awhile. I made this for my neighbor to celebrate the birth of their daughter. These neighbors are awesome people and we are blessed that they moved in a few years ago, so I wanted to make something special for their baby girl! 1. 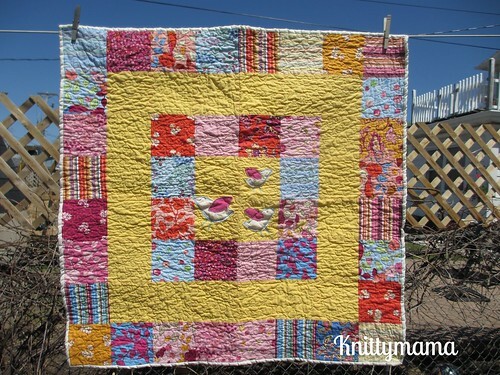 Lay out your squares so that you love how they look. If you are me, you will do this about 20 times. You will also do this with your children who will help you by rearranging them as soon as you find the perfect combination. Or, maybe you just give them to your children and let them plan it out. Now that I think about it, maybe I should have just done that in the first place…. 3. 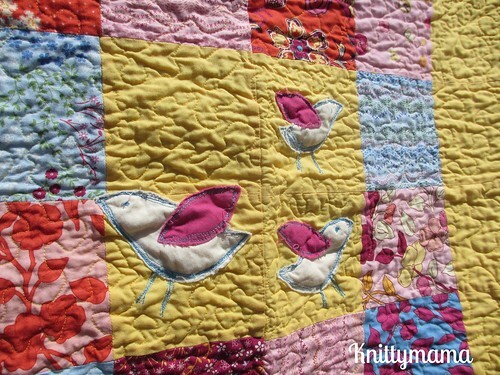 Sew your 4×4 blocks together to get four quarters of your quilt top, then sew those four together. 4. Make your birds. This is the fun part, and no, I’m not together enough to have an actual template to print out. You get to make it yourself! These guys are pretty easy to draw; you simple make a body and then the wing. I made three different sizes and traced them lightly with a pencil right onto my fabric, then cut with a scissors. There you go: Birds-in-a-Box! 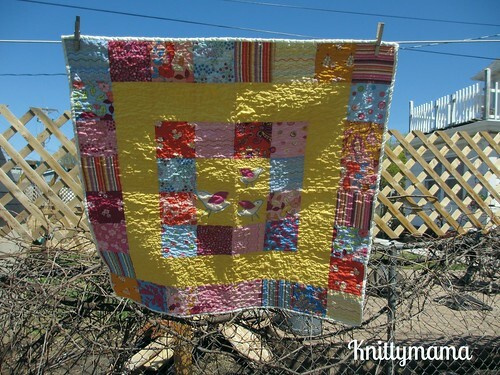 Throw together, quilt as you wish, bind off and give to your favorite baby.